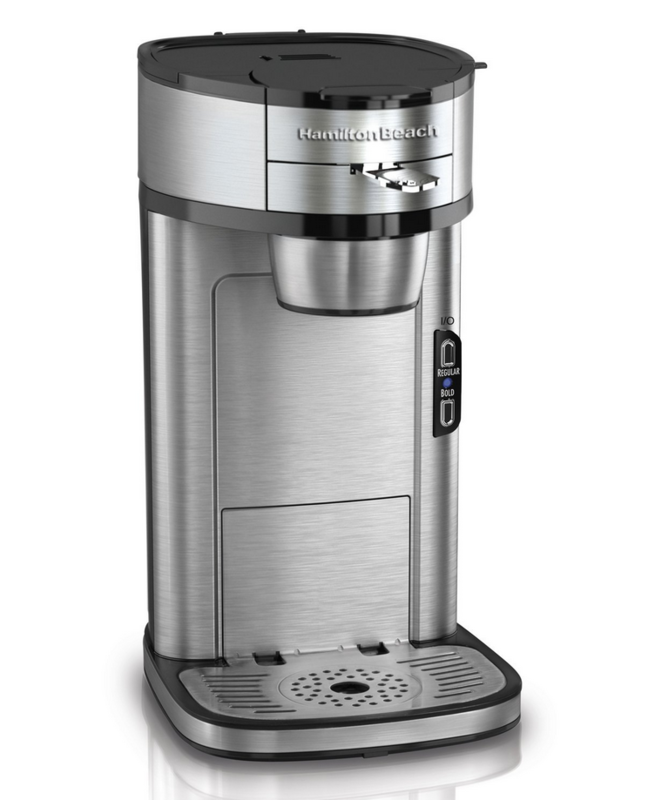 The Hamilton Beach Single Serve Scoop Coffee Maker provides a perfect cup of coffee without the need for expensive k-cups or machines. There are no super fancy gadgets attached or unnecessary buttons. It has a sleek modern design that looks great in any kitchen and this coffee unit makes just the right amount of coffee to get you going in the morning or anytime you desire. The Hamilton Beach brand of kitchen appliances is synonymous with affordable quality. Its affordable price and incredible options make it a winner for your home, dorm or office. This coffee maker is a great alternative to the Keurig K-Cup coffee makers that you see everywhere. 1. There is a built in adjustable stand to accommodate large and small cups and travel mugs. 2. Mesh scoop filters are included so there is no need for paper filters. 3. There is a spill resistant drain that helps with overflow of excess coffee. 4. There are 2 settings on the coffee maker for regular coffee and bold coffee for those of use who like an extra jolt. 5. The modern stainless steel design is quite durable and aesthetically appealing. 6. Automatic shut-off feature for safety. All of the features above are standard with every Hamilton Beach Single Serve Scoop Coffee Maker. With an easy set up, anyone can start having a hot fresh cup of coffee within minutes of opening up the box. Once plugged in, the process is simple – simply scoop, place and brew and your coffee awaits. Not only are there a ton of features, but the pros of owning this machine definitely out weigh the cons. Is the “The Scoop” by Hamilton Beach any good at making coffee? With there being so many single cup coffee makers on the market, why not choose one that is going to give you convenience of having a coffee shop type experience at home without all of the cost. This coffee maker provides you everything that you need to have that experience and a whole host of other benefits to keep you satisfied. 1. This coffee makes brew a very fast cup of coffee. An 8 ounce cup of coffee takes 90 seconds or less to brew. 2. Nationally recognized and received the Good Housekeeping Award for having an innovative design. 3. Your own inexpensive coffee grounds can be used, eliminating the need for expensive k-cups. 4. The coffee scoop are appropriately marked to ensure the right amount of coffee gets brewed every time. 5. Price – compared to other single cup coffee makers, this one costs pennies on the dollar. 6. Sleek design takes up very little space, but does a big job. Not only do the pros of owning this product outweigh the cons, but we cannot forget the easy cleanup process. In the fast paced world that we live in, being able to do things quickly are very important. Because there are only three removable parts, it is very easy to clean the machine. The 2 filters and cup rest are all dishwasher safe, while the rest of the machine should be cleaned out once a month with white vinegar and cold water. It is as simple as that. There are a few cons associated with this coffee maker. When you are using your own coffee grinds, be sure that what you have purchased have been roasted to ensure quality. In addition, in order to have the best possible result use the correct setting on the machine. If you are using fine coffee grinds you should use the bold setting to allow for a longer brew. This will keep you from having a weak cup of coffee and an undesirable result. As with any other product, the directions should be followed exactly in order to use the product the way it was intended. The Hamilton Beach Scoop Single Cup Maker is a fresh new alternative to expensive k cup machines. The faster brewing time,ability to use your own coffee grinds and the no fuss perfect cup of coffee system make this product a no brainer. When in the market for a single cup coffee maker choose the one that is going to give you the best bang for your buck and be prepared for coffee bliss. Thanks for the read, do you know the exact dimensions for this product?